Our own beliefs and ideas about how someone should be or how something should happen in the future is called expectations. You and I decide what they are, there’re no formulas or rules to follow so we make them up as we go and most times (some will argue always…) they may not be realistic. We decide what they are based on multitude of facts from cultural, social, personal experience and other influences that shaped our character and personality over time. When was the last time you got disappointed with a friend, family member, colleague or a situation? Today? Yesterday? Last week? It happens quite often and when that person or situation do not meet our expectations (which we created…) we get disappointed, hurt, let down, frustrated and confused. 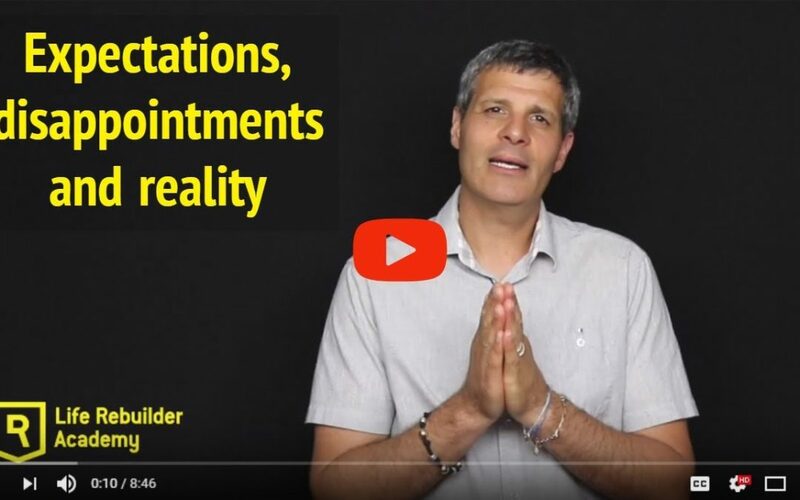 Along my journey on the Life Rebuilder path I have had many occasions to experience and discover the intricate play between expectations, disappointments and reality. Many times, during my recovery process I had constructed expectations about how I should feel, how fast my healing should happen and how others should be there to support me. This provided me with hope, solace, motivation and helped me set the tone moving forward. I have no doubt that you have done the same and to this day I believe this is a fundamental part of healing and recovery. However, when we hit rock bottom and are faced with a devasting event our capacity to see the situation for what it is and construct realistic expectations is diminished and therefore our expectations are set up disproportionally to what is. There’s a fine line between hope and fear that can harbor the potential for great disappointments. In this blog post I’d like to share with you what I call “The Expectation Filter” as it pertains to the Life Rebuilder journey. I have developed this process to assist myself and hope you’ll find it useful for your own Life Rebuilder journey. Research and acquire knowledge about your situation so you can make an educated expectation. (make sure it is from reliable sources only, not from aimlessly trolling the internet) Please remember, it is still an expectation and its relationship to what can happen in the future is your assumption of what it should be – we have no ability to know with certainty and we cannot predict the future. However, the clearer you are with the facts the less likely you’ll make a totally unrealistic expectation. Remain flexible and adjust as you go.Life will unfold as it will and, in most cases, not according to your preconceived plan. The more attached you become to your expectations the less room you have to adjust and change directions. Please share your personal insights and experience and help me spread the word by sharing this post with others.